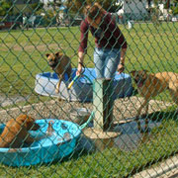 K9 BAR Academy offers excellent boarding services when you need a place for your dog to stay. 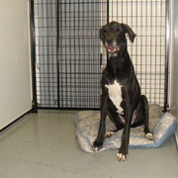 Our spacious indoor dog runs have a comfortable dog bed in each run, T.V. playing for your dog's entertainment, and interactive toys upon request. We also provide walks or play sessions during the day. If you would like your dog to play with other dogs while they stay with us, then we will enter him into dog play sessions during the day. Does your dog need special food, a bath, or medication? No problem. For a minimal charge, K9 Bar Academy will be happy to provide that extra special care. 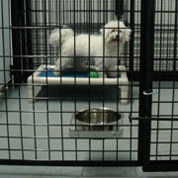 Prior to leaving your dog with us, we will set up an appointment to meet your dog and tour the facility. Dogs must show proof of current Rabies, DHLPP & Bordetella vaccinations. They must also be on a flea preventative. K9 BAR Academy can also make arrangements, (for an additional charge), to pick-up and drop-off your dog if needed. Our boarding rates are economical and begin at $40/daily. The day rates start at 12:00am midnight and drop-offs are between 10:00am and 11:00am. Sorry, there are no half day rates. Pickups can be scheduled at a time to accommodate both parties. Option of a raised dog bed to sleep on or bring in your own. Bronze service begins at $40/night for first dog, and $20/night for additional dog in same run. One 20-minute walk for each day of his/her stay in nearby neighborhood. Choice of a daily stuffed kong or a treat-filled interactive ball. Silver service is $50/night for first dog and $25/night for additional dog in same run. Choice of two 20-minute walks for each day of his/her stay in nearby neighborhood, or playtime in backyard dog camp. Our premium dog food or bring in your own food for no additional charge. Gold service is $60/night for first dog and $30/night for additional dog in same run. Design your own boarding plan with a K9 BAR Academy associate. Choose an extra activity for your dog, for example: a hike at Runyon Canyon. 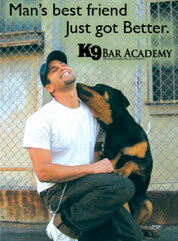 Call K9 BAR Academy to discuss Platinum custom service pricing. 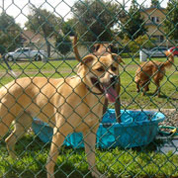 Dog park visits - $15.00 per vist per dog. Maintenance Training - $30.00 per dog per day.